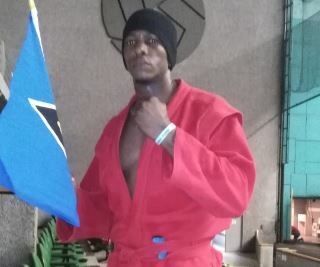 Press Release: Sambo athlete Thierry Augustine of the Sports and Combat Sambo Federation St Lucia has made history for our island and club. He won a bronze medal in Sport Sambo in the weight class of 100+ kg and a silver medal in Combat Sambo in the weight class of 100 kg.We would like to give special thanks to our sponsors the St Lucia Electricity Services , St Lucia Distillers and Bank of St Lucia International Ltd for making this possible and believing in our athletes and fledgling club. We would also like to thank to Mr Augustine for taking up this daunting task of representing our country against other Pan American nations. We would like to thank him for his patriotism, as this was his first time competing in a Sambo championship and he competed for one of the events on his birthday. Congrats to you ,only when you doing well in st lucia they care about you .